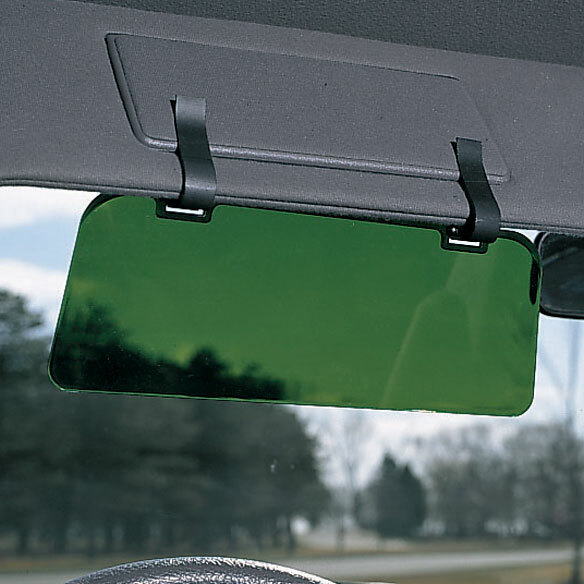 No-glare visor extender reaches where a regular visor can’t to block blinding glare from sunlight. Optically clear green plastic clips onto existing visor to reduce eye strain for safer driving. Will not obstruct view. Flips up and out of the way in seconds. Measures 11 1/4" wide x 4 1/4" high. I ordered this item for my car since I am 4'10 and while driving, my visor does not go down far enough to block direct sunlight. I liked the price, the delivery was fast, but the tinted visor is way too dark. I can't see traffic or anything around me, making driving a big risk. I am unable to use it. If it was lighter, it would be perfect. I gave it a two because of the price and fast delivery even though the item is useless for me. Well made product. Tint is dark so no need for sunglasses with this item. Can block glare from coming in side window onto your face as well by pushing visor over to the side. it is easy to pull the extension down when it's sunny; and put it back out of the way when it isn't needy. A Must Have in AZ! Living in Arizona, I could not drive without the sun visor. It is so easy to use and switch from one car to another. Great product! I am 5 foot 3 inches and when the sun goes down it hit me right in my eyes. Now I can drive in comfort and see much better. I have a Honda Fit, and the windshield is huge. I'm 5'3" so the visor on the car is totally worthless. This attaches onto the visor, overlaps a little on the mirror but it isn't a problem. I can flip it up/down, move the visor to position it just so that the sun doesn't glare straight into my eyes while driving to/from work. I am going to get another one for the passenger side for my son to use. I use it in the cars to give xtra protection from the sunlight. This visor extended is essential for anyone driving West as the sun is setting. It eliminates sun glare without blocking vision. Love the Visor! It meets all my expectations and looks like it came with the car! I purchased two of these for my daughters because I have had mine for years and I wouldn't drive without it. I guess if you are tall the visors in cars are low enough, but for me they don't work well when the sun is setting or low in the sky. The visor extender flips down quickly and you can angle it to your liking. It is made well and has lasted me for years. I would definitely recommend it to my friends. Perfect!! Especially for shorter people! This is a great item! Reduces glare instantly! I use the visors in my car. They are perfect for blocking the sun. I've had my visor for many years and am looking to replace it. No problem putting it on my visor or it staying. Absolutely NOT for the driver side, but for a short passenger like myself it works like a charm. My mistake, but from looking at the picture, I thought the clips were metal, but they're plastic, too. The visor comes off the clips easily when trying to lower it, but goes back on easily. Hopefully, this will not shorten the life of the item. It will work great for my mother, who is too short for the regular visor. I've used this type of glare cover for many years and it helps a lot. Some people have commented they can't see through it clearly but it's not really supposed to be used to see through for driving. Rather, you flip your visor down as needed and adjust the extender up/down to cover just below the sun line and you continue to look through your clear windshield for safe driving. When sun is lower, polarized sun glasses always in use for me. Only con, is that I wish it were an inch or two wider (side to side). My wife is short so I use this visor extender to help her protect her vision when the sun is coming into the windshield and her visor is too short to shade her eyes. The unit is fairly fragile, so you MUST be careful to keep from breaking it when handling. Bought this before elsewhere and returned it because there was still space between the visor and the extender for the sun to get in - not with this one. It's a little dark but still worth it. This shields the sun as it says but it is heavy enough that it causes the sun visor to keep falling down when it is NOT needed. Very annoying to say the least and startling as it flops down and hits you in the head. My visors are too thick for the attaching clips. The shade panel works to reduce the sun glare, but must be held by hand. It was a great idea, loved that but too flimsy, clips don't hold well. Wish I order the straps. I was disappointed in this item. I like the clip on feature. However it was too dark, too dense for me as the driver to see through as we head into the descending sun. Good for the passenger. Couldn't see the road in front of me clearly enough. Trying to figure out how to use... color is good! Shade is good but the clips are too weak and doesn't stay on the regular visor. Clips are too loose. This is a great sun visor, if it only stayed. I brought two of these. They are very dark, but I'm can't get them to stay on visor. I really wish I had gotten the ones with straps. The visors in our 2 different vehicles are too thick for attachments. I put this on the visor because my mother is short and the visor won't block out the sun enough for her sensitive eyes. She really can't see much anymore but light hurts her eyes. This is dark green and does block glare well. I read the reviews and hesitated but I found a solution for us. We just leave the shade in the down position and not touch it. We simply make sure to just touch the actual visor to bring it down. It's a shame they can't make one that doesn't pop off so easily. I would never use it on the driver visor. I wouldn't even ride with a driver who uses this shade to block the sun! Although the color is good, this plastic visor gives you a very distorted vision. Unless there is that blinding, direct sunlight in your eyes, I cannot use it. It seems it would give you dangerously poor sight. does not work, very poorly made. The grippers don't stay on. Will not grip my visor. The clips are only plastic, do not bend well, and one broke just putting it on the visor. Great idea, but is dangerously difficult to see through. Visibility is very poor through this visor. If you try to readjust it, it falls off. This product is a nice idea but the clips don't keep it attached so it isn't usable. Unable to attach to my visor , realized it was shipped to me broken. Will not stay on . If you hit a bump it falls off. This visor with the clips does not work with thick visors. It falls off when you "flip" it up or down. Also, when I tried to flip the clips they both fell off. I will not buy this prodoct again! Very unsatisfied! Please be aware that you cannot see red brake lights or red traffic signals through this viser. I push mine up to block light but never look through it. It works great on the passenger side. I don't like it it doesn't fit my visor and I can't use it . I won't be using as it so cheap that I can't fit it on my visor. It was a wast of my money. I would send it back but it would cost more than it is worth. blocks all ability to see...can't see through it at all. This visor blocks out all ability to see anything because of the green color...waste of money..cannot be used. Also clips will not fit over car visor. The visor is a bad design. It comes apart and falls off when pulled down. Clips made cheap and visor too small. This is actually dangerous to use. First you are unable to see the vehicles through the lens AND you can't see the stop lights either. Also have to have two hands to move it or else it will fall off. It needs to be only one-half as dark as it is. It's getting that when I drive home, the sun is setting and the glare is terrible. My sunglasses do not quite block the glare, so I thought this item would be the answer. I bought two, thinking my sister would also benefit from it. However, when I used it, I found out that the heavy green tint completely cancelled out the red traffic light. So it's actually dangerous to use this while driving, not safer as claimed. I was able to install on the visors, however with the first use the both clips broke on each one. They are not worth anything!!! Clip will not go on visor all the way and attempting to use it half way on was futile. If you have a puffy visor or one with a mirror, this will not work. Wasted money. I am totally dissatisfied with this product. Looking thru it it cancels out red lights, poor visibility, flimsy construction had a problem putting it on and it kept falling apart when I tried to adjust it. So glad I tested it before I gave them to my friends for gifts. Never buy this product, the color is so dark I can't see. I am a short person and the sun visor doesn't help much. I purchased this product but it is so dark green I can't see through it. I thought maybe a film was over it and hard to see but I've tried and can't find any film to remove. I'm very easy going and try not to be negative about anything. If u had tested this product before selling it you would have said that is too dark for driver to use because u can't see traffic lights. Might be ok to block glare on the passenger side but totally unsafe for a driver to use. Too dark. Very disappointing product. didn't fit visor as pictured and stated. clips are too close together and very short. If visor was moved it disconnected from clips. Didn't return because postage was too much. Wasn't worth spending it. Stuck with item. Very flimsy. Clips aren't even large enough to slide onto my standard size visor. I'm sure they would have broken had I tried. The visor itself is too dark. Visibility would be very poor. Not up to Miles Kimball's usual standards. Unfortunately, I am returning this product because the clips are entirely too small to fit over the visors in my Toyota 4 Runner. Totally unusable for me! The shade is too dark and can hardly see out of it. Could not see very blurry. Don't waste your time.Send it back for refund. I attempted to fasten visor to my sun visor in the car , and it broke . Attempted to fix w/o success. It is now in my garbage can. I would never buy this product again. The clips don't hold. It falls off when I try to use it. It is too dark to see to drive. It seems dangerous: It falls off while in use; it obstructs the view of the driver. It is useless and dangerous. The idea is ok but green plastic in almost a solid color. Am unable to see thru- may be ok to push up to partially block glare but not much more than regular sun visor in car. Don't expect to be able to see thru & still be able to see oncoming traffic and/or the road. Don't waste your money! To make it easier on sunny drives. To stop blinding sun into my eyes-I'm shorter than the visor. I am not Stanley.. He died in 2015. Iw anted a sun visor that would just flip up or down; not one that had buttons to adjust which was hard to do while driving. Exactly what I was looking for. Only place I could find it on the internet. just shopping & found what I was looking for! When I drive into the sun my car visor is not long enough for to keep the sun out. I like that this has double metal clips instead of the single plastic ones I found elsewhere. I have one of these and it's the best sun blocking visor I have ever bought. My mom borrowed one from a friend an wanted one - so Happy Mother's Day to her! I GOT IT FOR MY MOM WHEN SHE'S IN MY CAR. SHE ALWAYS SEEMS TO GET THE SUN IN HER EYES. My mom is 90 years ole and is too short so this will help her. My wife is short and gets glare in her seat next to me. Blocks more of the sun. to block the 5:00 PM strong sunlight coming my way. With morning sun these clip on visors will be a real asset for our visibility. its good to keep the sun out of your eyes, works good. I have been looking for this for several weeks. To keep the sun out of my eyes while driving. I had them before and they do a good job blocking the sun. easy to clip at once .